Why does it seem like everything causes cancer? Despite many advancements in medicine and overall cancer death rates steadily declining, every day we see more and more news about things that cause or prevent cancer. Some studies have shown that this overexposure to cancer-related news can create fatalistic perceptions. In other words, the perception that "everything causes cancer". This notion is only incorrect in itself, but also causes a variety of other related issues. If everything causes cancer, then leading a healthy lifestyle, giving up harmful habits or going for regular check ups seems like a waste of time. It also leads to a misunderstanding of how common cancer is or what medical treatments are available to prevent, or send it into remission. On a greater scale, seeing medical studies misquoted as saying silly things like "wine prevents cancer" or "cheese causes cancer" causes deeply ingrained misconceptions about the rigorousness of the scientific process, making it seem like scientists are constantly changing their minds and that science is, for the lack of a better word, a farce. The question arises: where are these fatalistic perceptions of reality coming from? This study was designed to test one possible answer to this question: whether traditional and online newspapers are a contributing factor to these perceptions. It is possible that due to various pressures to attract readers, the long-trusted newspapers are selecting more sensationalized headlines and thus are cultivating fatalistic perceptions about cancer. Cancer is one of the leading causes of morbidity and mortality worldwide, with approximately 14 million new cases in 2012. Even though it was responsible for 8.8 million deaths globally in 2015, in the United States the overall cancer death rate has been declining since the 1990s. The most recent SEER Cancer Statistics, updated in September 2016, show that overall cancer death rates decreased by 13% from 2004 to 2013. Despite this trend, a substantial portion of US adults continues to hold fatalistic beliefs about cancer and cancer prevention. In a study by Niederdeppe and Levy, from a representative sample of US adults (N= 6,369) almost half of respondents (47.1%) agreed that "It seems like almost everything causes cancer", 27.0% agreed that "There's not much people can do to lower their chances of getting cancer", and 71.5% agreed that "There are so many recommendations about preventing cancer, its hard to know which ones to follow". They also found that those who held fatalistic beliefs were also less likely to engage in healthy lifestyle habits (regular exercise, not smoking, eating healthy, etc.) Engaging in these types of activities has been shown to lower the risk of cancer, therefore it is safe to assume that those who hold fatalistic beliefs are at a greater risk of developing cancer. This brings up the question of locating the source of these fatalistic perceptions, and one naturally turns to the media and the role it plays in the dissemination of medical research. In this study, we looked at whether newspapers are a contributing factor to these perceptions through a content analysis of headlines in US newspapers within the past year. RQ1: Are traditional media gatekeepers focusing overwhelmingly on cancer causes and links? RQ2: Are the causes and links mentioned predominantly connected to factors that are seen as being outside the readers control (environmental exposure, genetics, food)? A list of the top 10 newspapers by print circulation was obtained from CISION, originally published June 18, 2015, updated May 11, 2016. Included in the sample were: The New York Times, USA Today, The Wall Street Journal, Los Angeles Times, The Washington Post, The New York Post, New York Daily News, Chicago Tribune, Newsday and am New York. Using the Nexus Uni database, article headlines were found for all newspapers except am New York, New York Daily News and Chicago Tribune. The Global News Stream database was used to obtain headlines of articles from these three sources. Those headlines within the past year (11/29/16-11/29/2017) that contained the keyword "cancer" were included in the initial search (n= 625). Out of those 625, 25 were excluded due to being duplicates; out of the remaining 600, 112 were health-related stories and were included in the final sample. For this study, a health claim was defined as a statement where the main purpose is to convey information about health: possible prevention, causes, treatment, links or cures of cancer. Those headlines that did not contain health claims were not included in the final sample and were coded only for category: Non-health scientific, Political/Policy, Legal, Celebrity, Industry/Economic, General news, Other. Headlines that were identified to have health claims were coded as to what type of cancer they were referring to, whether they mentioned science, whether they explicitly noted risk, and if they did higher/lower risk, and subsequently were put through additional layers of coding, four in total. Due to the exploratory nature of the study, descriptive statistics were obtained via EXCEL Data Analysis to survey the type of claims being made in the newspaper headlines. Since only 112 out of the original 600 contained health claims, this illustrates that, contrary to popular belief, articles containing health messages are a very small (19%) portion of news stories. Out of those 112, the majority (59%) were explicitly stating a connection between a certain factor and cancer, 31% were implying a connection, and 10% did neither. This illustrates that most headlines try to be clear and affirmative in their message, and list the main concept of the story clearly, for example: "How HIV became a cancer cure" (WSJ, 8/19/17), "Anti-clotting drug may have an unexpected benefit: A reduced risk of several types of cancer" (WP, 11/21/17), "Study: 1 drink a day increases breast cancer risk" (WP, 5/24/17), "Safe Ground: Coffee may keep cancer from brewing" (NYDN, 08/2/17). Implicit claims, instead, state their factors side by side implying a connection, often without stating the relationship clearly: "Breast cancer study looks at exposure to urban lighting" (CT, 9/6/17), "Weight: Teens and Colon Cancer" (NYT, 8/1/17), "Plastic Surgeons, on Breast Implants and Cancer" (NYT, 5/18/17). When comparing positive vs negative coverage, the results are split about equally, so no strong conclusions can be seen there. 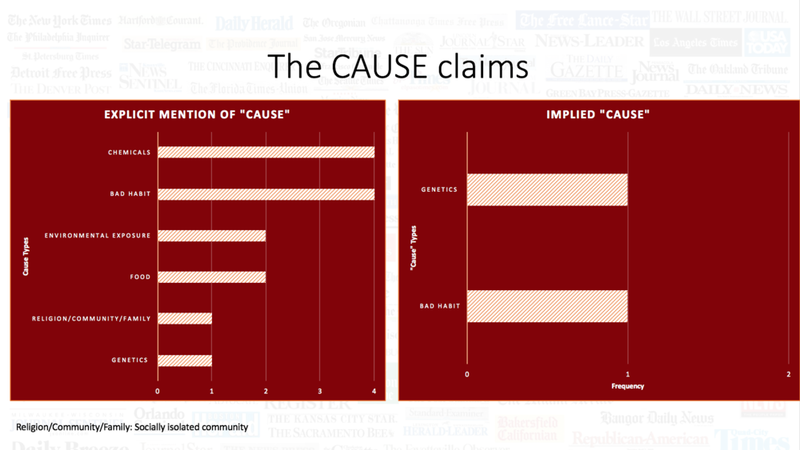 Headlines are coded as being "cure" claims", "prevention" claims, "cause" claims, and "link" claims. "Cure" claims were defined as a claim that a certain factor can cause cancer to halt or go into partial or full remission, for example: Fiber-rich diet may help fight colorectal cancer (WP, 11/7/17), NEW CURES FOR CANCER? Cutting-edge gene-editing could beat the disease (NYP, 5/30/17), Fitness May Stall Breast Cancer (NYT, 9/12/17). "Cause claims" associated a factor with the development, spread, re-emergence or worsening of cancer condition or risk, for example: Health officials tell Paramount firms to halt release of cancer-causing pollutants or face shutdown (LAT, 12/2/17), Study cites hair dyes as breast cancer risk: Straighteners, relaxers also may pose a danger (7/5/17), A large midsection may spell outsize health problems, including diabetes and cancer (NYP, 8/15/17). "Prevention" claims were defined as a factor that helps screen for, prevent or lower the risk for developing cancer, for example: Low-dose aspirin may cut risk of breast cancer (WP, 5/16/17), Breast-feeding may lower risk of breast cancer (CT, 8/16/17), These selfies can help save lives; Researchers uncover app that can detect pancreatic cancer (USAT, 8/31/17). "Link" claims associated a factor and cancer, but did not name the nature of the relationship between the two explicitly, allowing the reader to interpret the meaning, for example: Study Suggests Bacteria Have Key Role in Cancer (NYT, 12/15/17), Doctors find link between talcum powder use and ovarian cancer (ND, 1/22/17), Medicine: Cancer Risk in Heartburn Drugs (NYT, 11/7/17), They Got Breast Implants, Then a Rare Cancer (NYT, 5/15/17). As could be expected, cure and prevention claims were dominated with messages featuring medicine or medical procedures, with healthy lifestyle, genetics and food being honorable mentions. 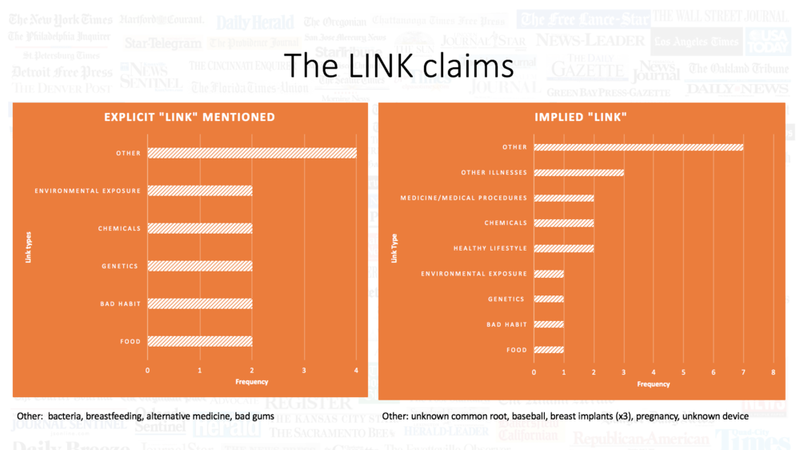 As for causes and links, per our research question we expected the claims to focus overwhelmingly on cancer causes and links, connected to factors that are seen as being, to a certain extent, outside the readers control (environmental exposure, genetics, food) if the newspapers were to cultivate fatalistic beliefs. According to the results, cause claims focused on bad habits and chemicals, exposure to which the readers can control to a higher extent than the others. In the link claims, we see other as the dominant category, followed by comorbidities (other illnesses) and equal amounts of the other factors. Therefore, the answer to RQ2 is also negative. This is illustrative of the overall vagueness of the link claim language, which may indeed contribute to confusion and false perceptions in the minds of the readers. This vagueness may be used as a hook to catch the audiences attention, but it also opens the story up to the readers interpretations. There is evidence to show that a large portion of articles are shared on social media without ever being clicked, meaning they were shared only based on headline and possibly an image. In a study by Gabielkov, 59% of shares URLs were silent or never clicked (Gabielkov, 2016). This gives great importance to the analysis of headlines as a stand-alone unit of measurement and influence, what messages they convey, and the possibility that, if vague, these messages can be misinterpreted and lead to false perceptions about things as vital as cancer prevention. The secondary variables of whether science or risk were mentioned did not yield any significant results. Only a quarter of all health claims mentioned a study, and about 16% mentioned risk. Out of those risk mentioned, most focused on lower risk. Though we were expecting more mentions of science in health claim headlines, it is possible they discussed the study in the body of the article, but did not mention it the headline. For risk, it is encouraging that fear-mongering high risk language was not found consistently in the same. As this study was exploratory, the implications of the findings are limited, but they bring up some interesting questions of media influence as we enter a new media age. Through focusing on the top circulation newspapers, our sample was already predisposed to be of higher quality than it could have been had we included, for example, tabloid magazines or popular online news sources. As stated prior, this was could be the focus on a follow up study. Newspapers were chosen here as there is incentive for even the trusted long-standing newspapers to engage in speculation and sensationalism. Our findings show that most likely newspapers are not the main source of fatalistic perceptions, so further studies could run a similar coding scheme on other various outlets for comparison, or even a combination of outlets to test out a more natural media exposure environment. It also must be noted that since even these traditional newspapers are all moving online, an interesting comparison could be done to sample the top 10 online newspapers by unique visitors and see how the headlines differ online vs print. Also, if looking online, one could separate by newspaper websites most visited by the US public, as opposed to print newspapers based in the US. This would enable foreign online newspapers such as The Guardian and The Telegraph to be included in the same, as they are widely popular among the US public, despite being based out of the UK. These were not included in our sample here. Due to the fact that our sample was limited to only the past year and only to those headlines that contained the word cancer in the title, our sample was limited. Also, by focusing exclusively on the headlines, did not have the full context of the article. Because of these sampling limitations and the four layers of coding, though we started with a fairly high sample (N = 625), we ended up with very few headlines in each of the individual categories, many of them being eliminated altogether from the results due to them containing no headlines. We also did not test for accuracy of the headlines, as that was outside the scope of this analysis. Future work could compare our exploratory findings with what scientific research was released in the past year to see how accurate the headlines were portraying the true state of the scientific literature at the time. If newspapers are reporting false claims, be they cure/cause/link or prevention, they would be contributing to false perceptions about cancer and cancer prevention. As media changes, society adapts. In the new media landscape where most people turn to the internet for answers about health issues (McCaw, 2014), the role of traditional gatekeepers is changing. New gatekeeping research has looked at modern technologies and accepted the audience as first of all, active consumers who are able to give feedback, and second, as secondary gatekeepers (Singer, 2014). With the wide spread use of the Internet, social media networks, easy ability for users to create blogs, websites and with even the traditional media moving online, the lines between traditional gatekeepers and secondary gatekeepers are becoming blurred. Luckily for the field of journalism, the traditional gatekeeper journalists still hold authority, media trust and cultural understanding that they are the best qualified curators of news (Deiuliis, 2015). That being said, even they cant deny the impact the public has had on how they present the news: news networks moving towards an intro-tainment 24-hour news cycle format, newspapers relying more on advertisement as a source of funding both in print and online, their ranking now measured in unique website visits or page views instead of print circulation, quality or seniority in the field. How much impact does traditional media have on the mind of the reader now and how do we disentangle its effects from all the other media exposure? How does one quantify the power of one, strong, persuasive headline in comparison to 50 vague ones? Further, more detailed research in needed to tease out the mechanisms of media effect on readers perceptions, taking into account the constantly shifting media environment and changing roles of gatekeepers. 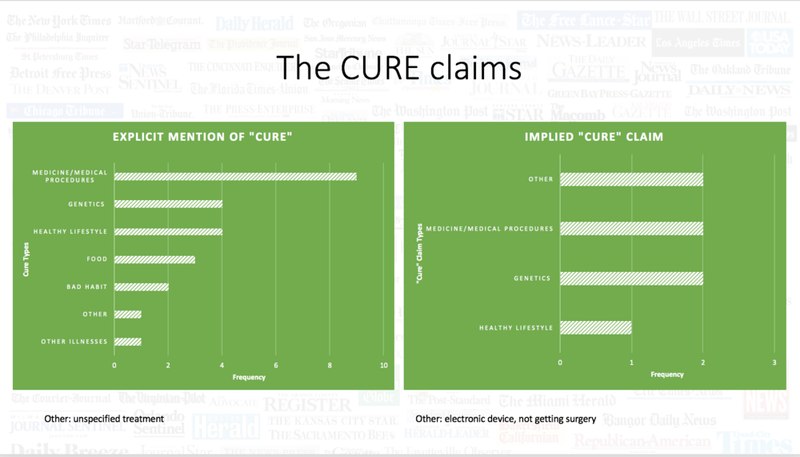 Most of claims focused on explicit ”cures”. But: links could potentially be interpreted as “causes”, which could contribute to fatalistic beliefs. Science is a constantly shifting field, and both the journalist gatekeepers and the public are always challenged to keep up to date on the latest findings. The theoretical goal is to get across the most accurate information possible, but many factors come into play that can influence what gets through and what messages tag along with it. Through continual study of both the cancer news content and its media effects, we can continue to find ways to decrease negative fatalistic perceptions and find ways to help people engage in preventative behaviors that will enable to cancer death rates to continue to decrease in the US and globally. Viral Networks: Does Misinformation Spread like a Virus? Thank you for checking out my website! If you have feedback, questions or would like to collaborate with me, please send me a message through the contact page! I would love to hear from you!